The Moody Blues are a legendary band. That’s indisputable. 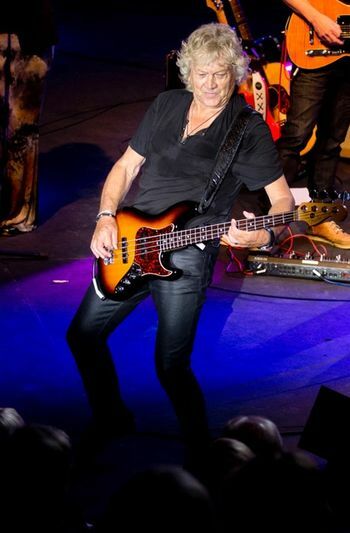 Now, founding member John Lodge is on a solo tour and he is coming to a small venue in this area. The Sellersville Theater. “We get to do songs we don’t normally do with the Moody Blues. Songs like “Candle of Life” and songs like “Saved By the Music,” Lodge said. They are due at the 300 seat venue October 15. Lodge has a new record out. It’s called 10,000 Light Years Ago. It came out last year . “I recorded it at Birmingham Town Hall in England. The reason for that was when I was growing up, my hero was Buddy Holly. I got a ticket to see him, front row and watched him play. I thought it would really complete the circle to me, if I could stand on the stage and play where Buddy Holly did,” Lodge said. He got to go downstairs in the archives and there was a photo of Buddy Holly on stage. On his solo record, he is trying to drive the songs with the bass line. One of the tracks is called “In My Mind”. “The songs I’m trying to do are built around the bass and we go from there. His concert on October 15 will last about two hours. He has a ton of material to do and we joked that he could be on stage for four hours and not even scratch the surface of material he has to play. One of the things that Lodge is involved with is charity. One such organization is the Grand Order of the Water Rats . “It'[s a fraternity of people who are in the entertainment business and we raise money for charity. People can write into the grand Order and ask for support for what they need,” Lodge said. If you are interested in going to this show, or to learn more about John Lodge, you can go to his website. Some tickets still remain, but not for long.